Bab Ezzouar is a suburb of the city of Algiers in northern Algeria. It is one of Algiers fastest growing municipalities and has seen many hotels and commercial malls being raised in the area. Bab Ezzouar is also the location of the University of Science and Technology of Houari Boumediene (USTHB), which is one of the most prominent technological universities in Algeria. In August 2009 there was a clash between local residents and Chinese merchants in this suburb, sparked by a confrontation between a migrant and a shop owner. About 100 people in total were involved. A Chinese diplomat said that it would not affect relations between China and Algeria. Bab Ezzouar is located some 12 km east by south-east of Algiers city just south of Bordj El Kiffan. Access to the commune is by the N11 highway from Algiers which passes through the north of the commune and continues east to join the A1 highway just east of the commune. Many other local roads connect the commune to the surrounding districts. The commune is fully urban in nature. The commune is served by the Algiers tramway which runs from the town to Bordj el Kiffan. Bab Ezzouar is a city made up of Commuter towns built successively since the late 1970s on an ancient marshy plain with unplanned subdivisions emerging since the 1990s. It has no real downtown although it hosts several administrations. The Cité Soummam located in the centre and the north-east. The area was known as Retour de la Chasse (Return from Hunting) during French colonial times. At that time there were two hamlets: one French, along the old national road to Algiers airport, and another named Sid M'hamed off the motorway behind the current Cité du 8 Mai 1945. The commune results from the administrative division of 1984. At the heart of the commune is the University of Sciences and Technology Houari Boumediene (USTHB) Algiers that has 27,000 students, but also the National Veterinary College (ENSV) and three university campuses. A new business district is in the process of construction in the south-east of the commune. 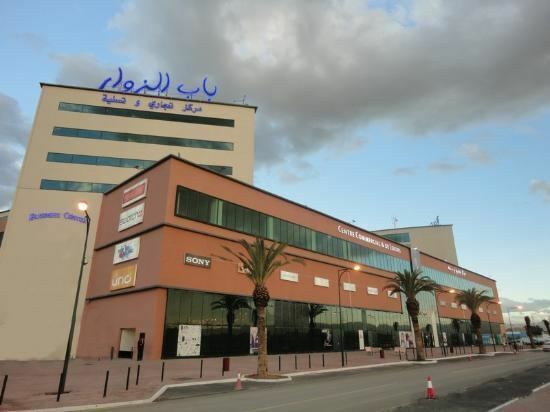 It includes an Hotel Mercure and Ibis and has offices for Mobilis, Algérie Poste, CMA CGM, and Air Algerie in the shopping centre. A shopping centre of 45,000 m² which extends over 3 floors plus two office towers of 20,000 sqm. Ismail Yafsah lived in the commune and was assassinated in the city that bears his name: Ismail Yafsah. Zaho, singer, was born and raised in the commune - specifically in Cité Tahar Rabia building No. 13. Rafik Saifi, footballer, was born and raised in the commune - specifically in the Cité du 8 Mai 1945 building No. 5.